See No Weevil, Hear No Weevil. > Blog > Uncategorized > See No Weevil, Hear No Weevil. Weevils, as many know, are a part of the beetle family. 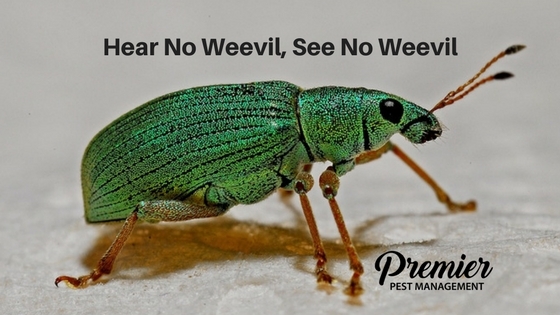 Weevils are classified as some of the most destructive pests in Canada. They are known for causing extensive damage to the agricultural industry including stored food product, crops, gardens and lawns. There are 40,000 species of weevils in the world and about 1000 of those reside in North America. What damage do weevils cause? Weevils are an agricultural menace and create havoc in grains and cereals. Sweet potato, alfalfa, rice and granary weevils are the most common in the prairies and can be found nesting under foliage or in grain based food stores. Weevils can defoliate or cause extensive damage to entire crops as they enjoy various parts of plants as a large part of their diets. Weevils cause damage by eating plants and by laying eggs in stored foods. The process of laying eggs in stored foods such as grains, creates heat and humidity making the perfect environment for mold and fungus to grow. Aside from spoiling crops and destroying stored food, weevils can also inhabit your home. How to detect a Weevil? If you suspect you have a weevil problem, check all your stored goods for small, lightly coloured grubs in your grain based foods, including cereal and flour. If you are unable to detect at grub’s in your stored foods but they have a damp appearance or packaged foods are moldy, it is a strong indication you have a weevil problem. Because weevils enjoy various parts of plants as a large part of their diets, you will noticed chewed foliage in your garden, on your lawn, or in your crops when you have a weevil infestation. How to get rid of a Weevil? As a homeowner, avoid weevil damage in your lawn by planting foliage, shrubs and trees that can resist insect damage, and store all food products in sealed containers. Prevention is key, however infestation of weevils is quite possible simply because they are so difficult to detect. Professional pest control remains your best option to clear an infestation successfully or prevent from one in the first place. If you suspect a weevil presence, don’t panic. Contact us today.